The holiday season is upon us and whether that means attending gatherings, hosting gatherings or doing some of each, having some, quick, easy go-to foods at hand can help reduce some of the inevitable stress. 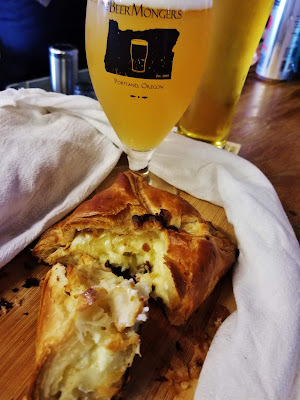 ‘Round here we are partial to things that pair well with beer and cheese, most any kind of cheese, tops that list. 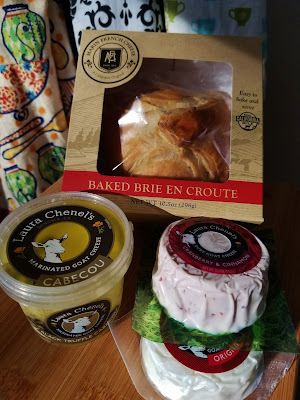 Cheese plates are great, a simple baguette with soft cheese can be divine and we've recently found out about a “looks fancy but is super easy” product - Baked Brie en Croute from Marin French Cheese. In existence since 1865, Marin French is the longest continually operating cheese company in America, located in Petaluma, CA. Wrapping their traditional Brie in a croissant-style pastry crust takes the cheese to another level in both flavor and presentation. Just 25 minutes in the oven creates a crust that is golden and flaky, encasing an ooey, gooey center. Its easily transportable size recently accompanied us to our favorite watering hole where we found it to be delicious with a glass of beer. Nearly as easy as popping a Baked Brie en Croute in the oven is grabbing a baguette and a soft cheese or two from the store. Plain goat cheese is an obvious choice for something that spreads easily but there are plenty of flavored soft cheeses as well. We quite enjoy mushrooms so Laura Chenel’s Marinated Black Truffle Cabecou was right up our alley for a savory option; blue cheese is always another winner. Flavorings can also go a sweet route, either by topping a schmear of cheese with a dollop of preserves or picking up one like Cranberry & Cinnamon. A bit skeptical as we opened up the round of cheese, we were soon won over by the incredibly balanced flavor that we found to pair well with Ruse Strand, a West Coast IPA. If you’re in the mood for a bit more cheese plates are another sure fire winner and can be as simple or as complex, as munchable or as meal-able, as you’d like to make them. Marin French offers a straightforward guide on putting one together and the cheese counter at your favorite store can help guide your selections further if desired. Disclaimer: We were provided with samples for review.